I’ve been doing a lot of thinking lately about wedding planning, and what a delightful and sometimes stressful process it can be for couples. As I mentioned in a previous post, I’ve been brainstorming some wedding how-to posts to share with you. My hope is to shed some light on wedding planning, inspire, make you laugh, provide tips and DIY ideas, and help you relax during your wedding journey. After some reflection, I put together a “Rules of Engagement” list to share. These “Rules” are based on my personal experiences and experiences of friends and wedding vendors, so please take from it what makes sense. Hopefully you find these thoughts helpful and inspiring! My first rule is “Be You.” Just like it sounds, be yourselves. This is your wedding, it represents you as a couple – both your journey together up to this point and also what you both hope for moving forward. I cannot stress this enough. The most important thing you can bring to your wedding is your relationship. You two will set the tone, and if you honor what you both want then everyone will feel it and have a wonderful experience. Even if you had to cut some costs and didn’t get the caterer of your dreams! Make Decisions and MOVE ON! Make decisions and move on. One of the major challenges of wedding planning is that there are a million decisions to make. Even for the decisive, the sheer amount of decisions is dizzying. If you take a lot of time deciding on one thing or another, you can become paralyzed with indecision and totally overwhelmed. It’s important to keep things moving along. Remember, once you have done the research and narrowed your options, there are no bad decisions. If you choose beef tenderloin as an entree option over filet mignon after obsessing for a week, be one with it and move on. Nobody will care as much as you. No offense. Choose your vendors wisely. You will be working with your vendors very closely so make sure you like them AND they are providing you with what you want. 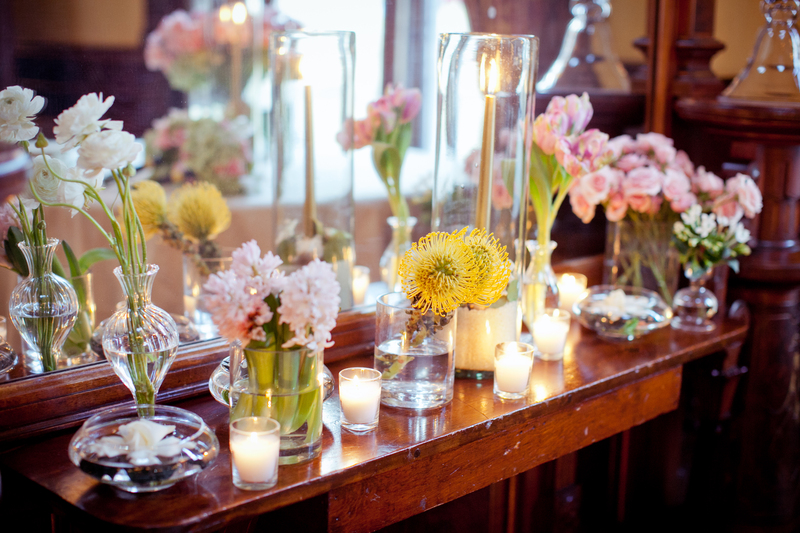 They will also be an integral part of your week of and day-of wedding experience so it’s important you find them soothing rather than stressful. Be Flexible. Like with most things in life, flexibility is the key to happiness. Be open to new ideas. If you are hell bent on a Lily of the Valley bouquet and are getting married in November, it’s not going to happen. Staying flexible to options that may not have occurred to you is to your benefit as A. you will make yourself crazy otherwise, and B. you may end up with an option you love even more than your original idea. 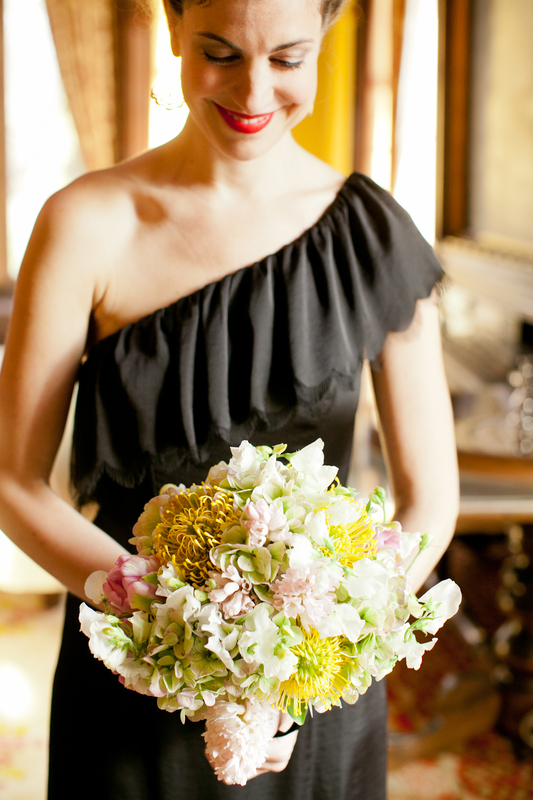 Quick story (and great excuse to show you some wedding flower pics) – you know how much I love flowers. I was so excited about getting married in March because it meant Cherry Blossoms. Well, Mother Nature threw us all for a loop this winter and the week before the wedding, the blossoms didn’t arrive. 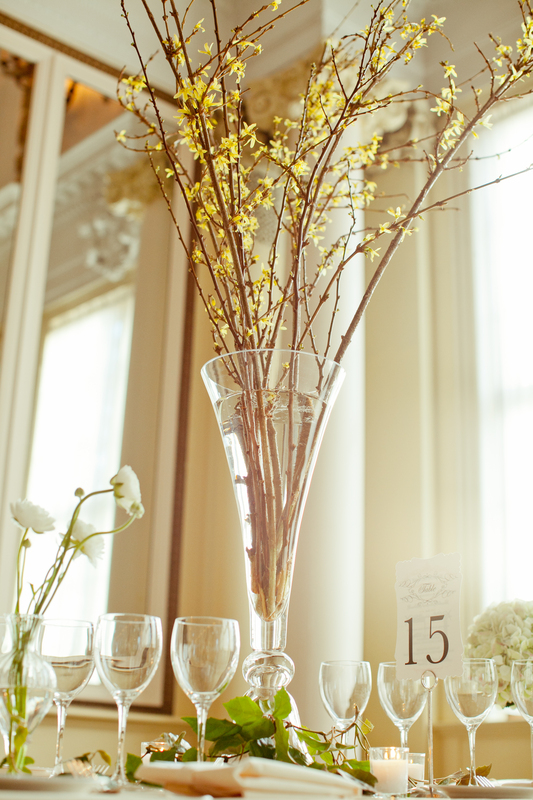 Our florist, Karen Splendido, and I discussed substituting Forsythia for the Cherry Blossom branches. The yellow Forsythia inspired us to add yellow Protea into the arrangements and bouquets – something that was a last minute change and added an amazing modern and fresh twist to our romantic flower scheme. It was such an unexpected and fabulous change! Keep the devil out of the details. Details details, so many details. Like, more details then you ever thought possible. We’re talking, fonts on invitations, colors of napkins, types of dining chairs kinds of details. It’s ok if this is not your thing because you’ve got options. You can certainly hire a wedding planner or coordinator, you can delegate specific decisions and responsibilities to family members/friends who are more expert than you. You can also keep yourself in check, and decide to keep a lightness about the details. And by this I mean, pick a few of the details that really matter to you most. Focus on these. Allow yourself to even obsess a bit, do your best and MOVE ON! Again, what matters most is that you’re getting married to your dream man/lady!! Feel that! Allow space for things to go wrong and to feel less than enchanted during the process. Wedding planning has it’s ups and downs. You are going through a MAJOR life change and being engaged is the beginning of a new type of relationship between you two. It can be stressful as family dynamics are involved, financing the wedding can be complicated, and making decisions with lots of opinions floating around has it’s not so desirable moments. Except that you might not feel stellar even though you are surrounded by a beautiful life event and beautiful wedding things. Sometimes it just feels icky and that’s ok. Let yourself feel it, and let it pass through you like the breezy bride/groom that you are/aspire to be. After all, it is just one day. Once I went to a wedding where the best man said in his speech, “May this be the least happy day of your lives. May every day only be happier after this one.” I was struck by this speech as it really hit home that what matters is your life together, not one day. It’s everyday that counts. So make the days leading up to your wedding a good practice for how the rest of your life will be.